"Misc." 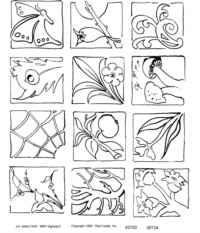 Sheets of Unmounted Rubber Stamps from Red Castle, Inc. Sheets retail prices are $22.00 each. Shipping and handling is $4.35 per order shipped to a US address, other addresses are actual cost. Sheets are available both wholesale and retail, wholesale accounts email or call for prices. Paper catalogs maybe printed by downloading a small program and running it while connected to the internet. Click here for details on downloading and using the print catalog program. Click on an image for a larger view, all sheets are about 7.5 x 9.5 inches. Use your browser "back" button to return to this page. and there is a $20 charge for returned checks. Send an email to Red Castle, Inc to order. Include your shipping address and phone number in email. we take VISA, MasterCard and AmericanExpress. (c) Copyright 2001 by Red Castle, Inc. Red Castle, Inc. - P.O. Box 1841 - Saint Cloud, MN 56302-1841 All Rights Reserved.